How much is Marshal Yanda worth? That’s a question the Ravens are exploring these days as the four-time Pro Bowl selection is heading into the final season of a five-year, $32.5 million contract he signed with the team in 2011. Owner Steve Bisciotti and general manager Ozzie Newsome have both made clear this offseason that the team would like to sign Yanda to a contract extension that will increase the chances that one of the best offensive linemen in team history eventually retires as a Raven. But finding compromise on such a deal may be difficult. Yanda will turn 31 years old in September, so he’ll obviously be looking at this as his last contract. For those who think his age should lower his price tag and want to point out that the Ravens don’t pay for the past, Yanda remains at the top of his game, viewed around the league as one of the best guards in football. 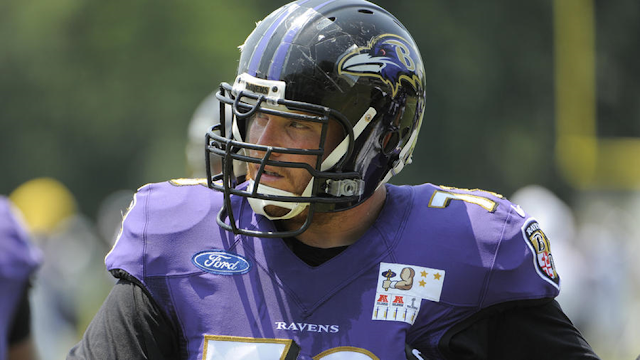 He is the leader of the Ravens’ offensive line and one of the most well-liked and respected players in the locker room. When Eugene Monroe and Rick Wagner were hurt late in the season, Yanda moved out to right tackle and his play didn’t drop off. And one more thing: Yanda has missed just two games over the past six seasons. In other words, Yanda won’t come cheap. At the very least, you’d have to think that Yanda’s agent, Neil Cornrich, will be looking to eclipse two deals given to guards in free agency this offseason. In March, the Arizona Cardinals signed Mike Iupati, the former San Francisco 49er who has been selected to three Pro Bowls, to a five-year, $40 million deal that includes $22.5 million in guaranteed money. Former Denver Bronco Orlando Franklin agreed to a five-year, $36.5 million pact with the San Diego Chargers, which includes $20 million guaranteed. If Yanda is looking to be the highest paid guard in football -- and to be clear, he’s never said publicly that he is -- the Ravens would have to go even higher than the deals that Iupati and Franklin got more than two months ago. They’d have to beat the six-year, $51 million deal ($30 million guaranteed) that Logan Mankins, now with the Tampa Bay Buccaneers, signed with the New England Patriots in 2011. Would the Ravens be willing to go that high for a player as important and beloved as Yanda? That remains to be seen, but it certainly would be difficult for a team that is always dealing with a tight salary cap situation. The Ravens know they’ll need to restructure the contract of quarterback Joe Flacco next offseason. Starting left guard Kelechi Osemele, strong-side linebacker Courtney Upshaw, safety Will Hill, kicker Justin Tucker and punter Sam Koch could all join Yanda as unrestricted free agents. If they can’t agree to a deal, the Ravens always have the option of using the franchise tag on Yanda, but that would be costly, too. The franchise figure for offensive linemen this offseason was $11.6 million. They could also let Yanda walk after the season and put the money toward a contract extension for the younger but less decorated Osemele. What seems especially unlikely is the Ravens being able to afford to keep both guards. They’ve used fifth-round picks on guards in back-to-back years and either John Urschel or Robert Myers should be ready to step in if either Yanda or Osemele departs. The Ravens do have time on their side and more often than not, Newsome has been able to work out deals to keep the franchise’s signature players in purple for their whole careers. But sometimes -- as was the case this offseason with the extension/restructure talks with Haloti Ngata -- it just becomes impossible to bridge the gap between what the team has to offer and how it values the player with the player and agent’s asking price. Yanda clings tightly to his Iowa roots and to a blue-collar mentality, and he’s not one for extravagance. And that’s actually quite the understatement. But based on value, production, durability and importance to the team, It would be hard to blame Cornrich if he insisted that Yanda make more than the $8.5 million per year on average that Mankins has gotten under his current deal, or if he was adamant about Yanda getting close to or eclipsing $30 million in guaranteed money. A little over 14 months ago, the Ravens signed Monroe to a five-year, $37.5 million deal that includes $19 million in guaranteed money. Sure, book-end tackles demand more money than interior offensive linemen, but Monroe was never considered one of the top players in the league at his position and he had played with the Ravens for less than a full season when the deal was reached. How much more is arguably the league’s best guard worth, a guy who will almost certainly be inducted into the team’s ‘Ring of Honor’ one day? It will be up to the Ravens to answer that question.